Hundreds of thousands of people poured out onto the streets of Tehran and other cities and towns across Iran on Monday, marking the 40th anniversary of the 1979 Islamic Revolution. Masses of Iranian flags were seen in the capital’s Freedom Square amid chants of “Death to America” — a chant that has become normal at anti-West rallies across Iran – with chants also filmed of “Death to Theresa May” and Queen Elizabeth. Attempts to burn US and Israeli flags were hampered as torrential rain in the Iranian capital turned efforts into piles of blackened ash. The government’s messaging centred around the slogan, “Yes, we can”, a slogan made popular by former US President Obama who ironically lifted sanctions on Iran during his time in office before being reinstated by President Trump. Iranian President Hassan Rouhani stood before a big crowd on Monday and vowed to boost his country’s military and ballistic missile program, defying US pressure and sanctions. Along with the chants “Death to America,” Monday’s marches were also a backdrop to the military’s display of Iranian-made missiles, which authorities showcase every year during the anniversary celebrations. Iran has missile capability of up to 2,000 kilometers (1,250 miles) — far enough to reach Israel and U.S. military bases in the region. Downtown Enghelab, or Revolution Street, was decorated with huge balloons as loudspeakers blared out revolutionary and nationalist songs to encourage people to join the rallies. The rallies also saw the recital of Quranic verses mixed with revolutionary chants as of people carried Iranian flags and demonstration banners. Stalls that lined the road to the main square distributed information pamphlets, hosted live radio shows and showcased young children singing Islamic and nationalist anthems. “When we say ‘Death to America’ we mean down with Trump, and (US Secretary of State Mike) Pompeo,” said cleric Mohammed Reza Maqsood, 32, to a CNN reporter. Maqsood was echoing an address made by Iran’s Supreme Leader Ali Khamenei on Friday where he said that “Death to America” applied only to “Trump, (National Security Adviser) John Bolton and Pompeo,” despite the chant being a feature of many previous rallies that preceded Trump’s premiership. 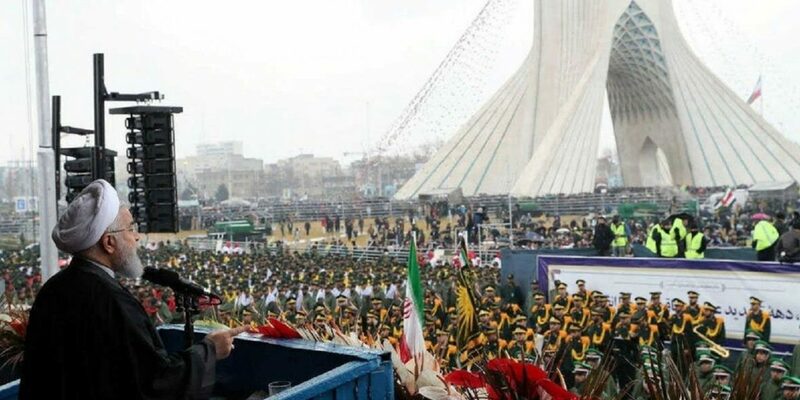 Speaking from a podium in central Tehran, Iranian President Hassan Rouhani addressed the crowds for nearly 45 minutes, lashing out at Iran’s enemies — America and Israel — and claiming that their efforts to “bring down” Iranians through sanctions will not succeed. However not all Iranians are celebrating the 40 years of oppression by the regime. Most protests, however, took place outside Iran due to the clampdown on opposition groups. For example, in Paris several thousand Iranians and supporters marched through Paris against the government.